If you have an overflowing stash of toilet paper rolls, Mason Jars, and newspapers, this eBook is for you! 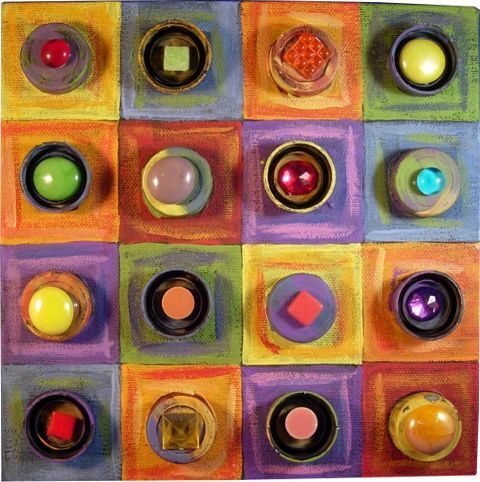 Even plastic bottle lids can be recycled for fantastic art projects like this one from Heidi Borchers of Inspired at Home. 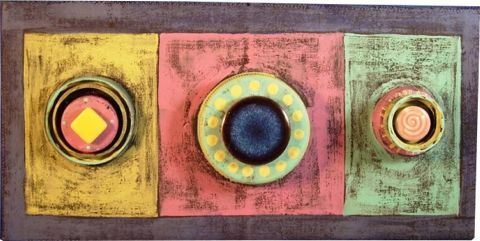 Turn the lids into a contemporary art canvas that's sophisticated but easy enough for kids to do! Use pencil and ruler to measure and mark sections on canvas. On the 8” canvas, we divided into 16 - 2” squares. On the 4” x 8” canvas, we measured 3” x 3” for the center, flanked with two 2” x 3” sections. Glue one plastic bottle lid into the center of each section. On the 8” canvas, we glued every other lid reversed. One up, one down, one up, one down. On the small canvas, we layered all sorts of sizes and shapes. Let glue dry. Paint the entire canvas and plastic lids with black paint. Let dry. Using photo as guide, paint each section with a different color. Note that some of the black paint is left to show through the color. Paint each plastic lid with a different color. Let dry. Glue a jewel, flat marble, or tile into the center of each plastic lid. Let glue dry. Heidi’s Designer Tips: To transform this into an affordable kid’s group project, use a cardboard cereal box instead of the art canvas for the base. Just tape the box closed with masking tape before gluing and painting. The kids will enjoy seeing how they can turn trash into an artistic treasure! Find out what other cool projects you can make from recycled plastic by checking out our list of 14 Easy to Make Water Bottle Crafts. I love this project idea!! I knew there was a reason I've been saving all those water bottle lids lol ... Thanks to Heidi Borchers for this clever, artistic idea .. not just for kids.. :) for us big kids too :)))) Peace out. I am looking forward to trying this, it looks great. like this ;I have tons of bottle top lids. been saving for a year or more. I put them on old mats with glue and put them as a weed barrier at my flowers. I have some made like the american flag, red,white,and blue.,some made like big daiseys.Going to make more when i get time. This looks neat! But wouldn't it be easier to paint the sections first, and then glue the lids on? Also, if you're using the cereal box version, stuff the box with wadded up newspaper or something similar, to make a firmer surface for gluing. And now I'm going off to start collecting lids! I love this! I can't wait to save up enough lids to make my own. It will look great in my craft room.